In deepest Chelsea, London UK, there is a gem often overlooked by international visitors. 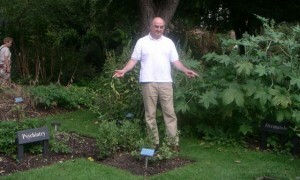 In the picture DrB stands between the Psychiatry and Dermatology beds in Chelsea Physic Garden. Containing almost 5000 plant species from all over the world, the garden was founded in 1673 by the Society of Apothecaries, to study the medicinal properties of plants. On the day I visited I noted not only how Psychiatry and Dermatology were almost “bed-fellows”, but also how neat and tidy Psychiatry seemed, in contrast to the exuberance of Dermatology! Next time you have a chance, it is well worth a visit. The café is also notable for its home-baked cakes.